The conductors carry electric current or power from the sending end stations to the receiving end stations. Solid conductors are difficult to handle because of poor flexibility. Moreover, when solid conductors are employed for long spans tend to crystallize at the points of support of because of swinging in wind. To overcome this problem stranded conductors are used. Stranded conductors have a central wire around which successive layers of wires is overlapped. For n layers, the total number of strands (wires) will be [3n(n+1)+1]. The overall diameter of a stranded conductor will be (2n+1)ds, where ds is the diameter of each strand. In the process of manufacturing, ‘concentric lay’ method of construction is adopted in which the adjacent layers are spiraled in opposite directions so that the layers are bound together. High conductivity i.e. low resistivity in order to reduce the area of x-section (diameter) which consequently reduces the wind load. High tensile strength so as to withstand mechanical stresses. Low cost so that it can be used for long distances. Should not be brittle i.e. it should be ductile so it can easily be drawn in the shape of the wire. Copper is an ideal transmission line conductor material owing to its higher electrical conductivity and greater tensile strength. It is always used in the hard drawn form as stranded conductor. Though hard drawn (cold rolling and drawing) reduces the conductivity slightly but it increases the tensile strength considerably. Copper has high current density; therefore, a lesser x-sectional area of the conductor is required for the given current. This decreases the wind load acting on the conductor. It does not corrode in normal atmosphere and is not subjected to electrolytic troubles. It is quite homogeneous, durable and has high scrap value. There is no doubt that copper is an ideal material for transmission and distribution of electric power. However, due to its higher cost and non-availability, it is rarely used for overhead lines. Nowadays aluminum in place of copper is used for transmission and distribution of electric power. Its use is being restricted for the manufacturing of machines only. Aluminum is cheap in cost and light in weight as compared to copper but it has much smaller conductivity and tensile strength. The following points are worth noting. The conductivity of aluminum is 60% to that of copper; therefore, to maintain the transmission efficiency i.e. to keep the same resistance, the aluminum conductor has a diameter about 1.26 times to that of copper. The increased diameter exposes the greater surface to wind pressure and increases the wind load acting on the conductor. This requires the use of higher towers which leads to greater sag. The specific gravity of aluminum is 0.304 times that of copper. Therefore, though for the same resistance area of x-section of aluminum is higher but the weight is only one-half the weight of equivalent copper conductor. Thus, the supporting structures for aluminum need not be made so strong as that for copper conductor. Due to lower tensile strength and higher coefficient of linear expansion (1.4 time that of copper) of aluminum, the sag is greater in aluminum conductors. Because of greater sag, light in weight and greater transverse load, the aluminum conductors are liable to greater swing and hence larger cross-arms are required. Considering all the properties like cost, conductivity, tensile strength, weight etc., aluminum has an edge over copper. Therefore, aluminum is being widely used as a conductor material. Due to low tensile strength, aluminum conductors produce greater sag. This prohibits their use for longer spans and hence makes them unsuitable for long distance transmission lines. In order to increase the tensile strength, a galvanized steel wire is inserted in the center (core) of the conductors. Thus, the aluminum conductor is reinforced with a galvanized steel wire. The steel conductor is galvanized in order to prevent rusting and electrolytic corrosion. The composite conductor thus obtained is called steel reinforced aluminum conductor or aluminum conductor steel reinforced (A.C.S.R.). The cross-section of a steel reinforced aluminum conductor is shown in Figure. The cross-sectional area of the two metals are generally in the ratio of 1:6 but in case, higher tensile strength is required the ratio can be modified to 1:4. The net tensile strength of steel-cored aluminum conductors is more than aluminum conductors which permits the use of longer spans. The breaking load of such a composite conductor is considerably greater than that of equivalent copper conductor and its weight is still smaller which permits the use of supporting structure of less strength. The sag with steel-cored aluminum conductors is much smaller which permits the use of towers having smaller heights. Therefore, A.C.S.R. is a very popular material used for transmission line conductor. low wind and ice loading due to smaller diameter. Galvanized steel conductors have been used for extremely long spans because of very high tensile strength. These are only found suitable in rural areas where cheapness is the main consideration. These are only used where a small power is required to be handled through a small distance. However, because of its poor conductivity (nearly 13% that of copper) and high internal reactance this, material is not used in transmission or distribution lines to carry current. The most important application of galvanized steel conductors is as earth wire. Earth or ground wire is run at the top of towers in H.T. lines. In the design of ground wire, the main consideration is the mechanical strength of the conductor. Thanks for reading about transmission line conductor material. #2 Which of the following regulations is considered best? #5 Which of the following bus-bar schemes has the lowest cost? #7 By which of the following methods string efficiency can be improved ? #9 By which of the following a bus-bar is rated ? #11 For which of the following equipment current rating is not necessary ? 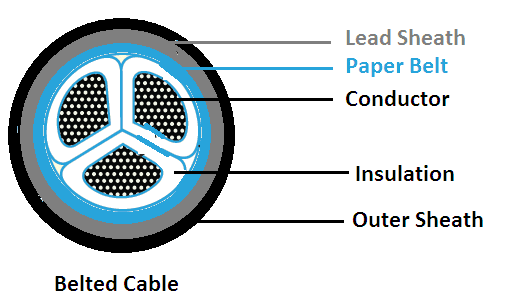 © https://yourelectricalguide.com/ transmission line conductor material.